After 2 weeks of not cooking, due to a lack of dishwasher (yes, we were actually so lazy we dirtied as few dishes as possible! ), I wanted to try something lengthy, complicated, warm and comforting. Something that could go terribly wrong, but could also go terribly right. So, I broke out my Tagine cookbook, by Ghillie Basan, to find something spicy and filling to warm us on a cold winter night. 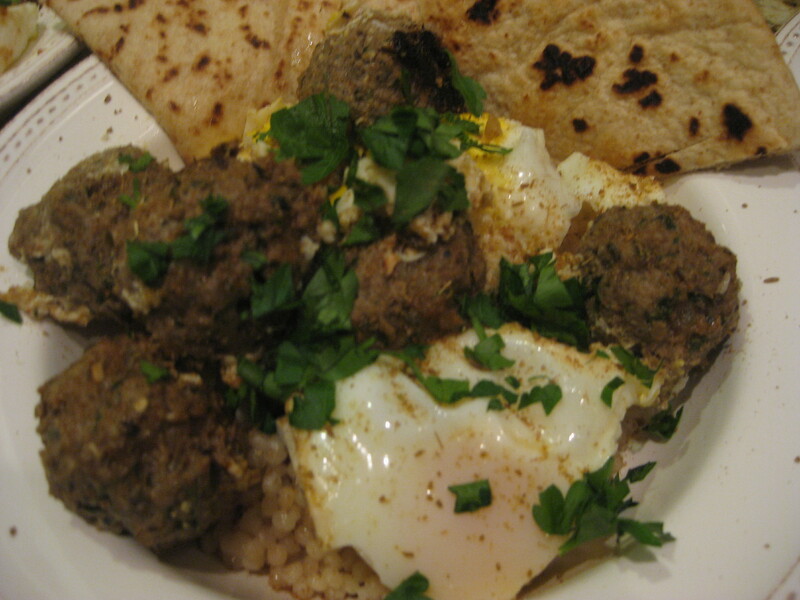 This dish caught my eye because even though it was comprised of the traditional lamb that is in many African dishes, it came together as meatballs, with sunny side up eggs, all cooked in the tagine. The meatballs are called kefta, and they are filled with amazing spices, and are poached in water (which helps them keep their perfect shape), then cooked in spiced liquid that absorbs into the meatballs, and creates a hot, dry bottom of the tagine in which to cook the eggs. 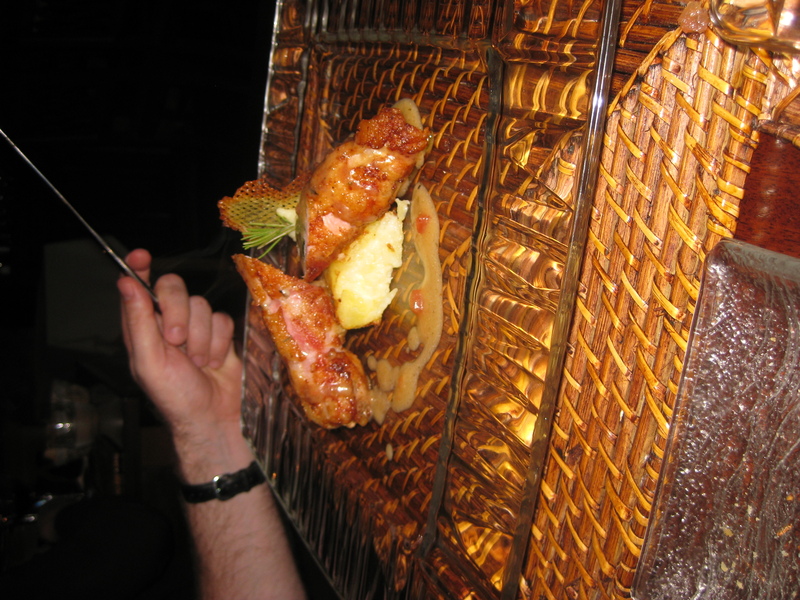 Not only did the dish turn out perfectly, but the combination was nothing we had ever experienced. The spice, ras-el-hanout, is worth seeking out (I found mine at my local spice store, but you can also find it online). My only caution is to be careful of the spice level. I will write this recipe with the spice level I used so hopefully it will do the trick (vs. the original recipe from the cookbook). Trust me, it is worth the effort. And, ironically enough, at the end of the day there really weren’t many dishes to speak of – except the tagine itself (which doesn’t go in the dishwasher). To make the kefta, put the ground lamb, onion, mint, ras-el-hanout, cayenne and parsley in a bowl, season with salt and pepper, and mix well together. Using your hands, knead the mixture and mold it into small balls. Fill a tagine (or dutch oven) with water and bring it to a boil. Carefully drop in the kefta, a few at a time, and poach them for about 10 minutes, turning them so they cook on all sides. Remove them with a slotted spoon and drain them on paper towels. Reserve roughly 2 1/2 cups of cooking liquid. Add the butter to the tagine with the reserved cooking water and bring to a boil. Stir in the salt and cayenne and drop in the poached kefta. Cook over high heat until almost all of the liquid has evaporated (about 15 or so minutes). 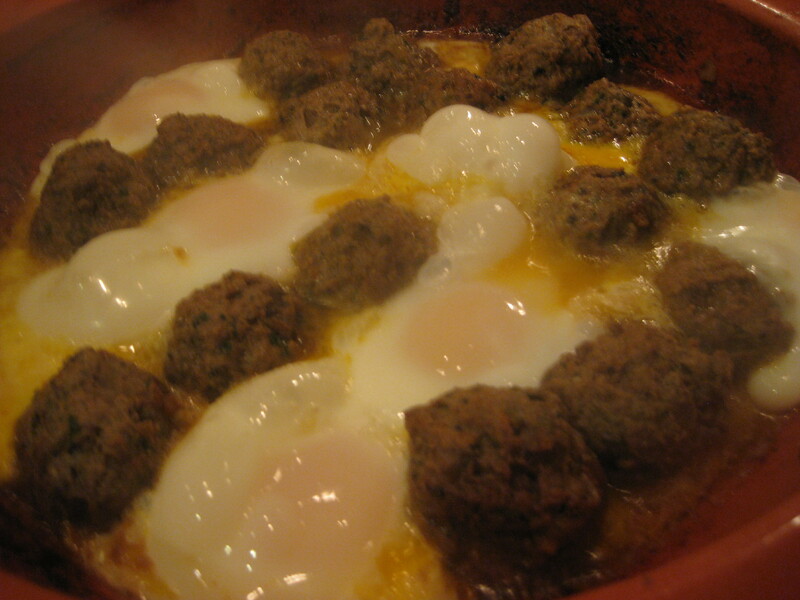 Carefully crack the eggs around the kefta, cover the tagine with the lid, and cook and steam until they are just set. Sprinkle the roasted cumin seeds and the chopped parsley over the top of the dish. Serve with pearl couscous and flat bread. A tagine is a spicy, rich stew from northern Africa. 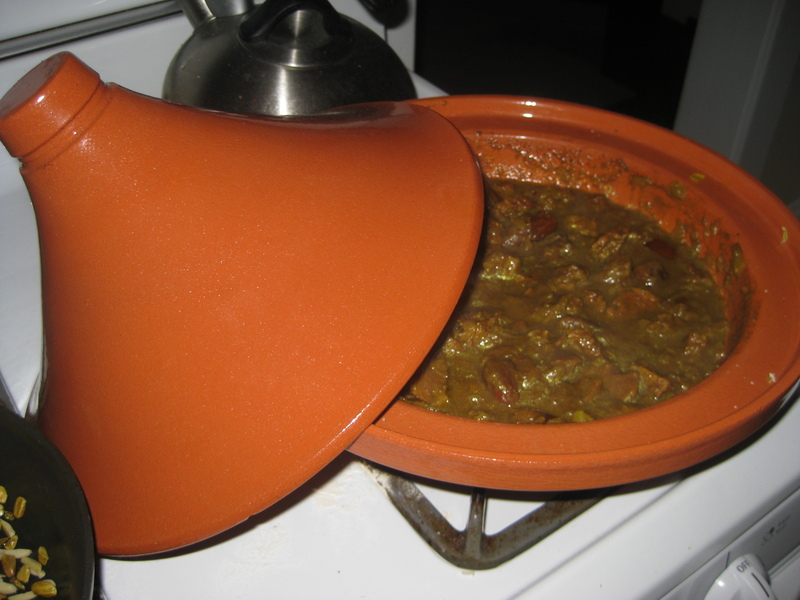 The name tagine is also given to the vessel it is cooked in – a shallow, round pot with a unique conical lid designed to lock in moisture and flavors, cooking the food gently in a small amount of liquid. My first few tangines I used my go to – my dutch oven. But as my love for the rich dish grew, I realized I needed to do it right. So, I bought a tagine at Sur la Table. And, of course, I couldn’t buy the tagine without a Tagine cookbook as well. Although the tagine is big, bulky, and really doesn’t have a convenient storage location, it is well worth the purchase. The meat, when cooked in this vessel, is so tender and moist – despite being on a stove for so long (a testament to the cone-shaped lid). This particular tagine was my first in the authentic cookware and has a wonderful sweetness from the dates. So, if you have a few hours to cook on a Sunday night (keep in mind about 2 hours is completely inactive cooking time), I would give this tagine a try. Cook it in any pot you use for long cooking, but if you get hooked on tagines like me, it is well worth the investment of an actual tagine. Plus, it is just plain cool to look at! 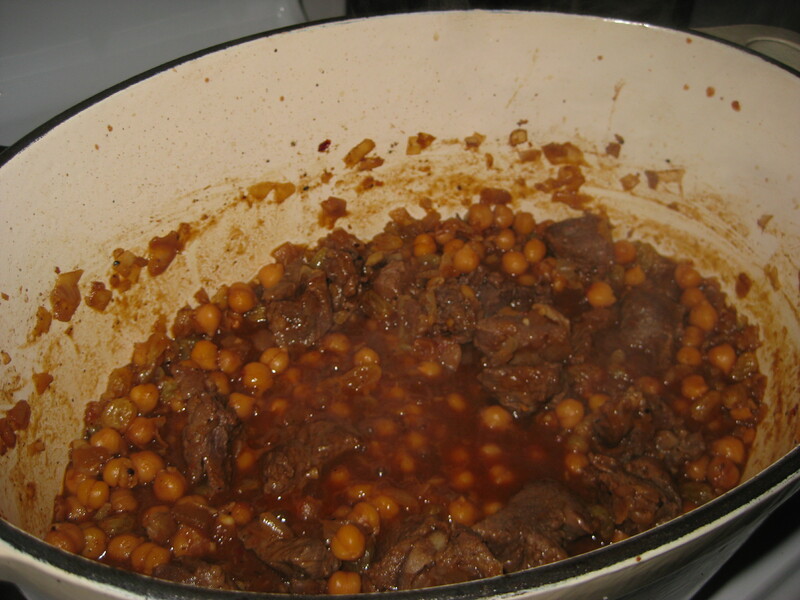 Thanks to Tagine: Spicy Stews from Morocco by Ghillie Basan for this fantastic recipe! Heat the ghee in a tagine or heavy-based casserole dish. Stir in the onions and saute until golden brown. Stir in the tumeric, ginger and cinnamon. Toss in the meat, making sure it is coated in the spice mixture. Pour in enough water to almost cover the meat and bring it to a boil. Reduce the heat, cover with a lid and simmer gently for roughly 1.5 hours. Add the dates and stir in the honey. Cover with the lid again and simmer for another 30 minutes. Season with salt and lots of black pepper. Heat the olive oil with the butter in a small pan. Stir in the almonds and pistachios and cook until they begin to turn golden brown. Scatter the nuts over the lamb and dates and sprinkle with the flatleaf parsley. Service with buttery couscous. As we left the Mediterranean behind in Cinque Terre, we were lucky enough to have hired a private driver/tour guide to take us from the coast into Siena – stopping within the Chianti region along the way. If it is in your budget, that is one travel recommendation I would have to make. Although we loved the trains (at first) and driving (although we thought we might not make it in one piece), there is something so relaxing about having someone else worry about it for you. And, instead of having a full day of travel from Cinque Terre to Siena, we had a full day of amazing food, wine and scenery. 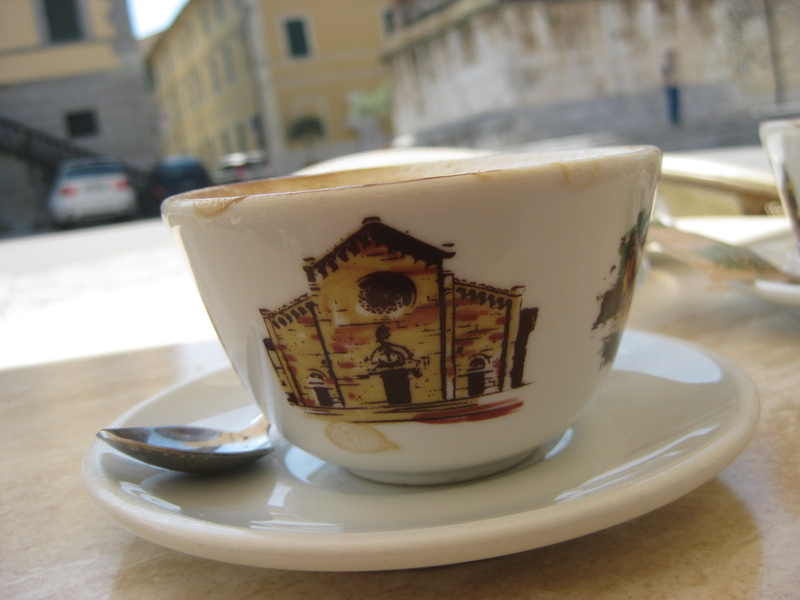 Our first stop along the way was Pietrasanta. No, it isn’t in most tour books. But, it is the town from which my husband’s grandfather is from, and thus it would have been a shame not to see it, being so close. No culinary memories other than a cappuccino on their town square – but the memories were a bit more nostalgic for us. We found the church his grandfather was baptised in, and spent time in the square he surely played in as a young boy. We then made a quick stop – and by quick I mean 20 minutes – in Pisa to see the tower, get a photo, then get the heck out of there. It was crowded, and quite overrun with tourists (ourselves included, of course). 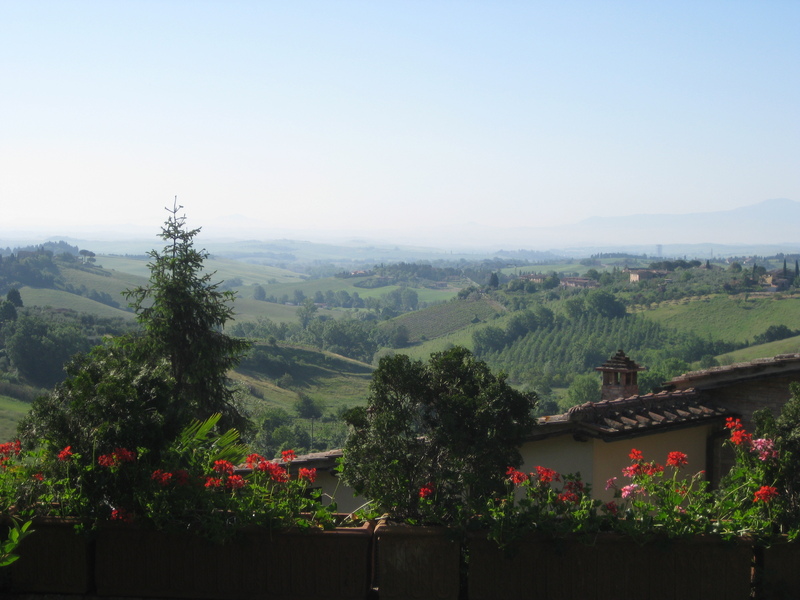 Then we headed south, past Florence (I know, everyone can add the “you are crazy” here), and to the Chianti region. We told our guide, Alessandro, we liked to go off the beaten path, where we could really experience the culture. So, we ended up in the small village of Lamole, just outside of Greve. I give him kudos for this choice, because I have yet to find a person who has been to Lamole. It was a quaint little town, but what I remember most was, of course, lunch. table for two on a patio, overlooking sweeping views of Tuscany. Blue sky was interspersed with ominous clouds, yet we dined outside without a drop of rain. 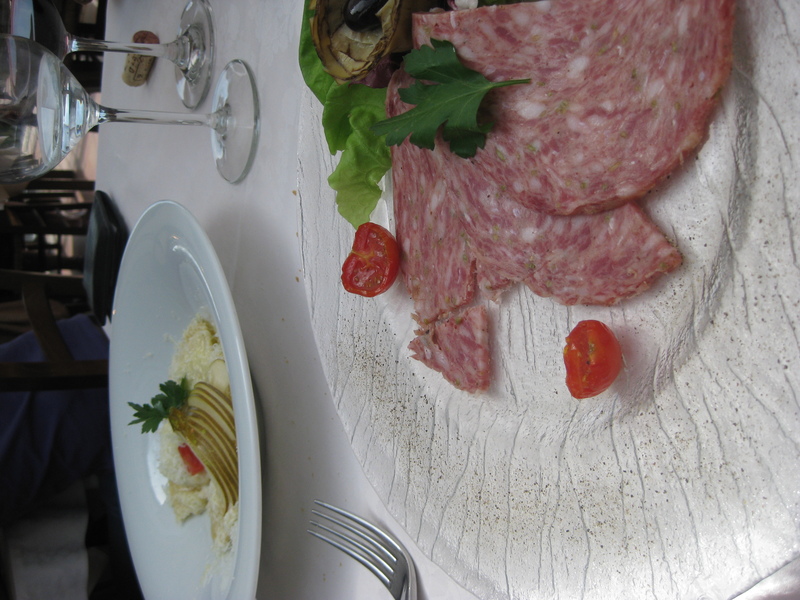 I started the meal with salumi, but unlike the salumi I had in the past, this was a softer kind. It had lots of pepper to give it a kick, and it was amazing. Rob got a pear ravioli that was so soft, sweet and salty, it melted in your mouth. 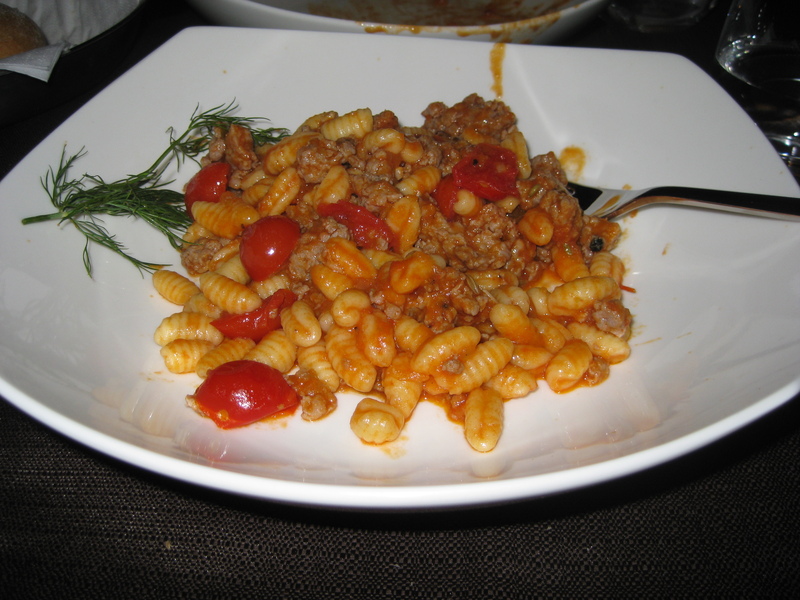 Then for our main coarse, I got the boar pasta. 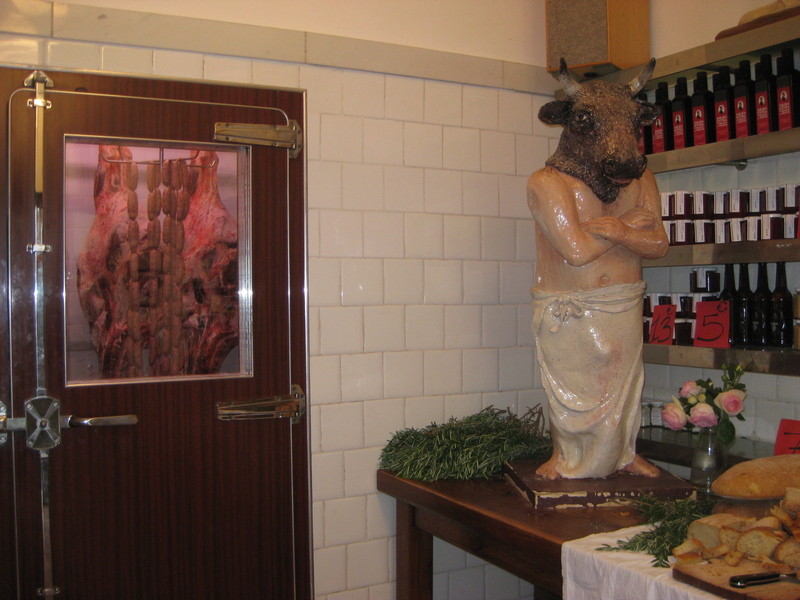 I was told Tuscany is known for its boar, and you shouldn’t go there without trying it. It was slow cooked, braised for many hours, and added to a ragu over freshly made pasta. It tasked like a slow roasted pork (but a little richer, on the edge of tasting like beef). It was to die for. Rob got a pork that was almost too pretty to eat – until the first bite, then it was gone in a hurry. Dessert was something chocolate, filled with chocolate, then drizzled with chocolate. The perfect end to a perfect meal. Then, it was time for some wine tasting. 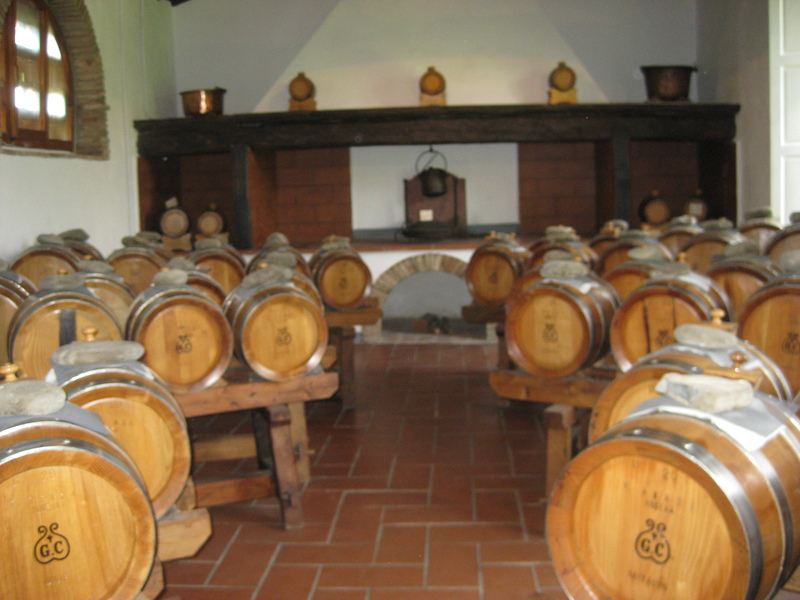 Alessandro took us to a very small winery – definitely off the beaten path – for a private wine and balsamic vinegar tour. If you are like me, I knew very little about how they make balsamic, and the patient process that goes with it. We arrived at Montagliari Winery, in the heart of Tuscany, with more sweeping views of valleys and an approaching storm. We got the key to the place, then Alessandro took us into the balsamic vinegar aging room. I learned that the vinegar goes into 5 different casks, all of a different type of wood to give it its flavor – all the wine evaporating and condensing in each step. The result is a small, concentrated amount of 35+ aged balsamic. It is not a wonder, now, why Italian balsamic can cost in the hundreds. 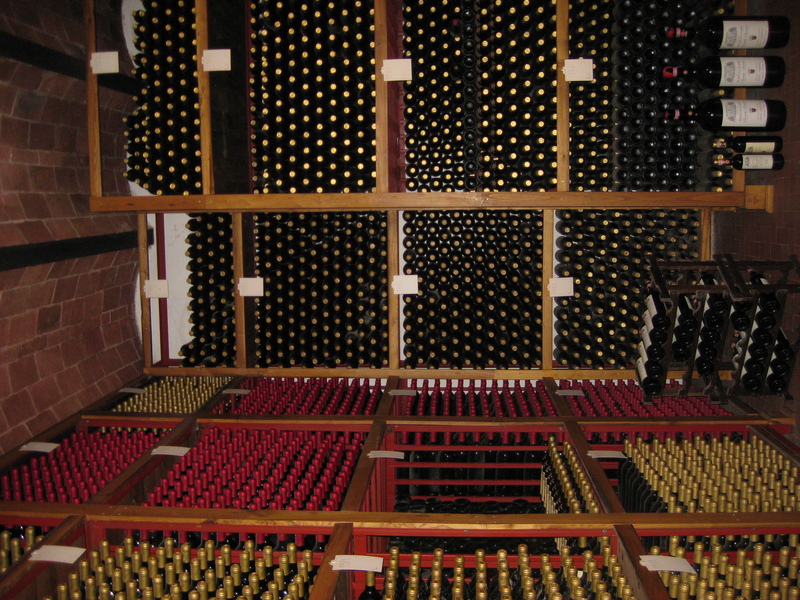 Each cubby was one year of wine - there were many rooms, dating back to the 70s and 60s. bottle of wine from the year I was born. After seeing the process, it was time to taste, so we went into the wooden paneled tasting room, just as we began to hear thunder threatening in the distance. The winemaker himself, David, joined us to participate in the tasting. 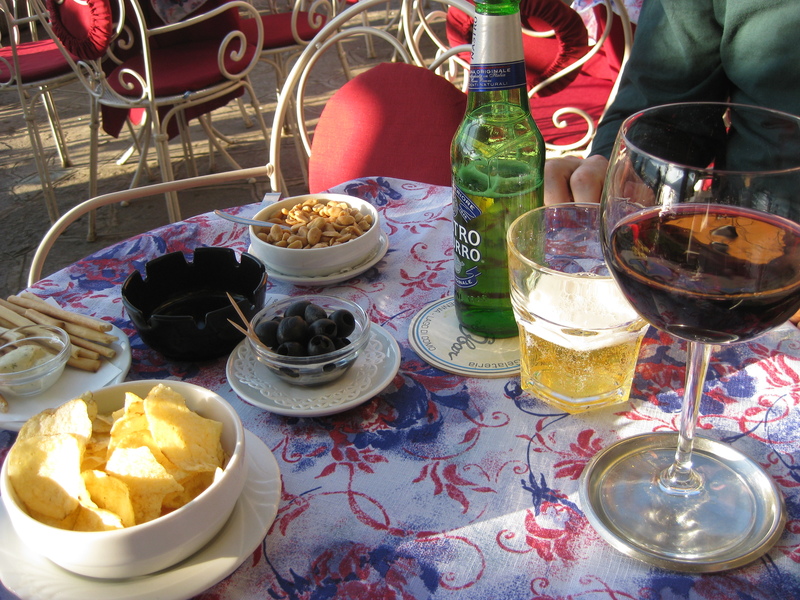 We started with the balsamic vinegar, which was like nothing I have ever tasted in the US. 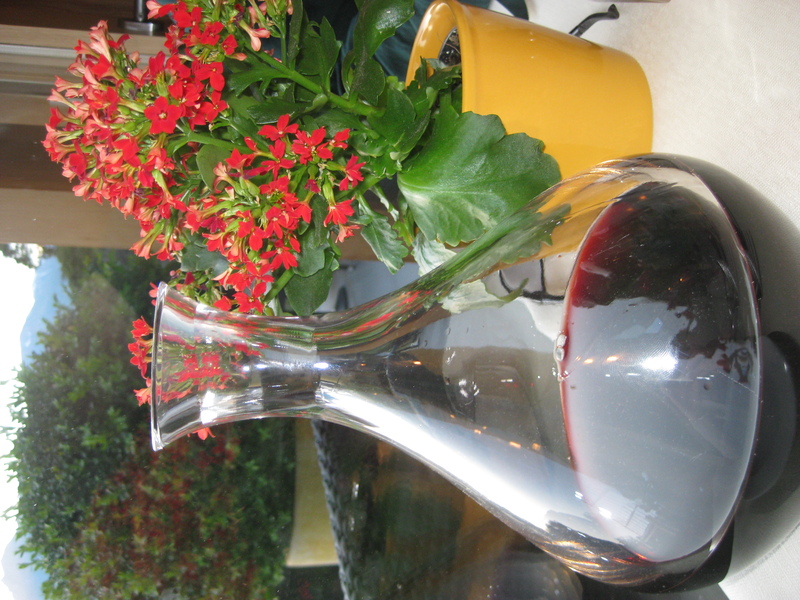 Then, the wine, which was so earthy and rich. We tried some grappa (I am NOT a fan!) and some vin santo (I am also not a fan, but Rob is). 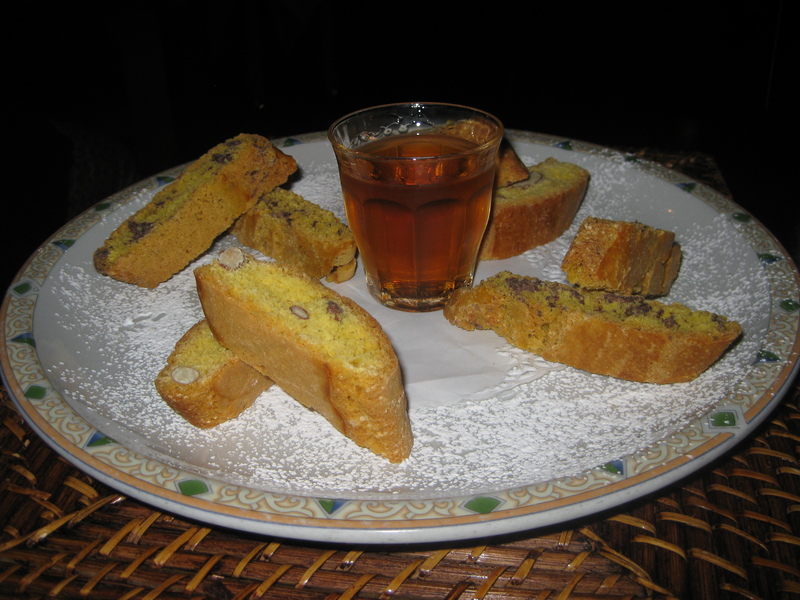 Apparently, the way Tuscans drink vin santo is by dipping biscotti in it (because it is very strong otherwise). The winemaker even pulled down a good bottle of scotch for my husband, when he mentioned his love for it. We were talking about the winery with David, drinking great Chianti, and now listening to the rain falling just outside the open door. It was one of the most memorable experiences. butter. Now, I may not speak the language, but when I saw the spread I knew that Chianti butter is the famous lard butter (lardo). I must admit, sounds a bit odd, but if you forget what it is and just pop it in your mouth, it is amazing. If you ever go there, you must try it. After then a short stop at the Pentecoste e Castellina (a regional wine festival), a tasting at Rocca delle Macie Winery and a visit to the walled town of Monteriggioni, we were dropped off at our hotel in Siena – full and tired. 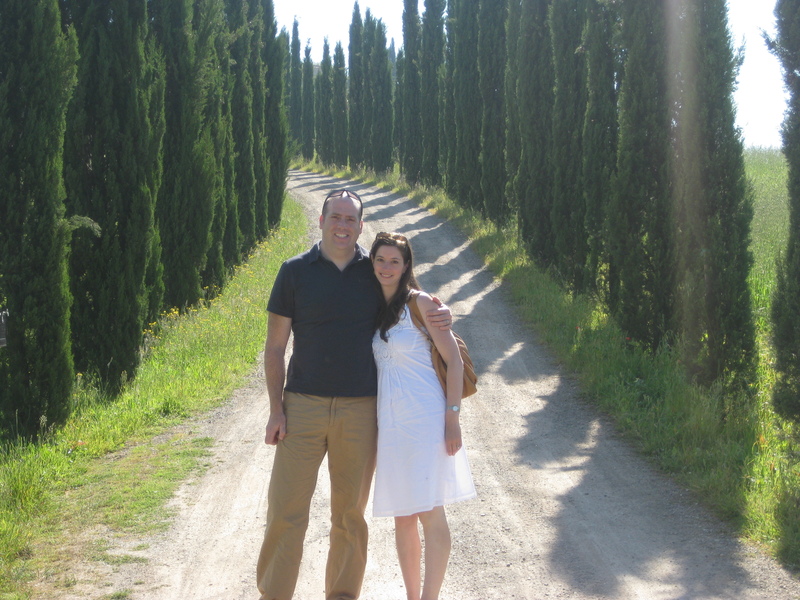 The next day, we had another tour guide, Nathalie, take us south a bit through the Brunello region. 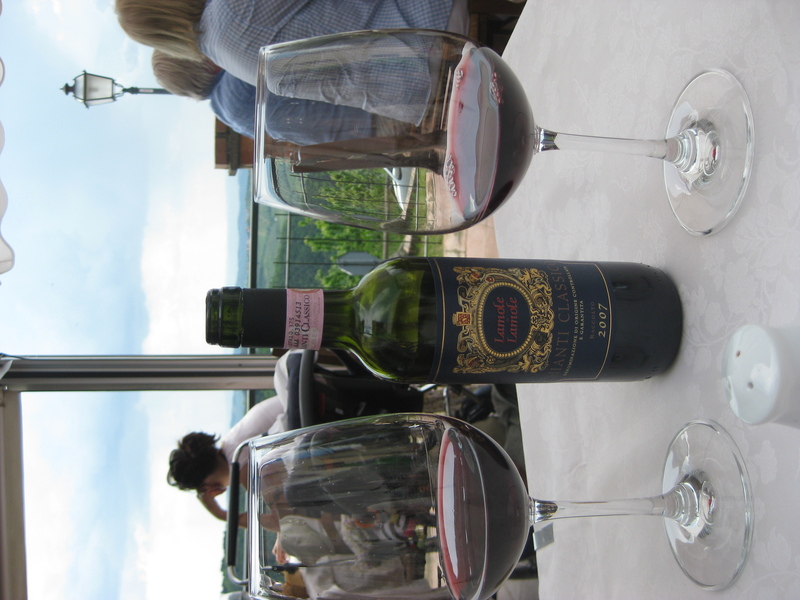 If you learn about Brunello di Montalcino, you will have a fond appreciation for it. The wine HAS to be grown in Montalcino and HAS to be 100% Sangiovese grapes. There was a scandal a while back, where a winemaker was adding grapes other than Sangiovese to his Brunello (making it NOT a Brunello). It was called Brunellopoli by the Italian press. You can tell, Italians take this tradition very seriously. So, if you are ever wondering why Brunello di Montalcino is so expensive, it is because it can only be made in this small town south of Siena. Needless to say, you cannot afford land here, unless you are growing grapes and then selling expensive wine. We spent some time in the city of Montalcino – a beautiful hill town that truly lives for its wine. Then, we went to the outskirts to a winery called Poggio Antico. The winery had more sweeping views of the cyprus trees, and we went inside to get a private tour with another couple from the US. We then tasted the wines, and had a profound appreciation for the tradition of them, and a bit of sticker shock at the price. to Pienza for lunch. The restaurant Nathalie took us to once again had sweeping views of Tuscany (hard to avoid these views since almost all of the towns are hill towns). We sat along the hedge, looking into the valley, and had amazing wine and, of course, amazing food. 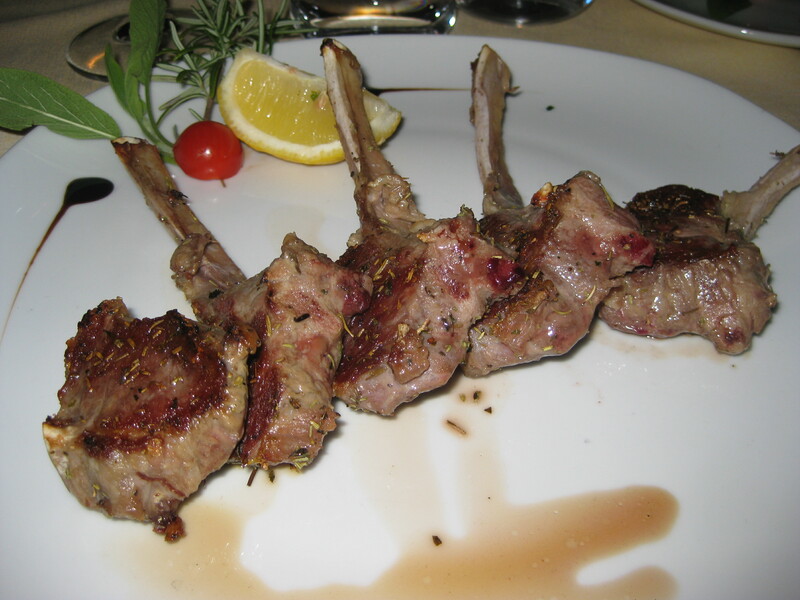 I had a lamb dish – which may have seemed a bit heavy for the spring, but it melted in my mouth. 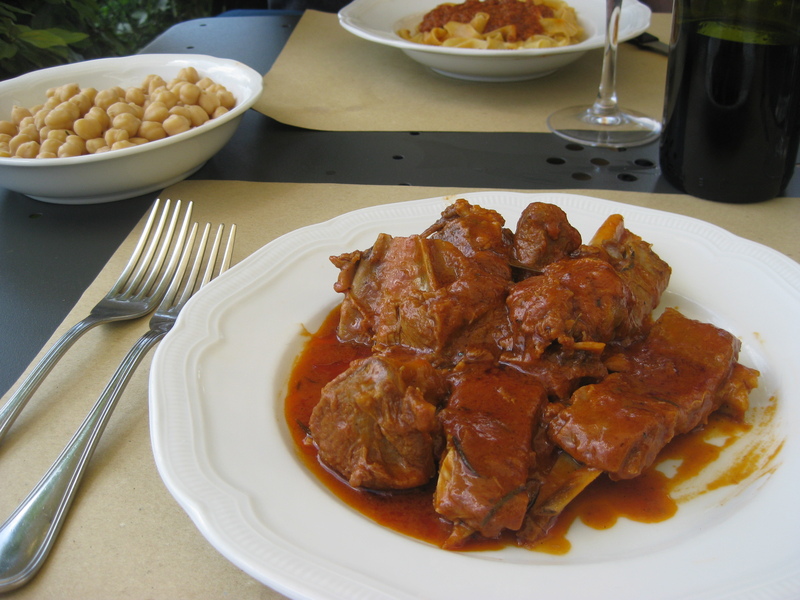 Lamb is another cucina tipica in Tuscany, so I had to have it. Rob had a ragu that was absolutely amazing. Then we toured the town, which was quaint, filled with flowers and had a romantic vibe. Much to his dismay, I told Rob I want to move here someday. It was the perfect little town. 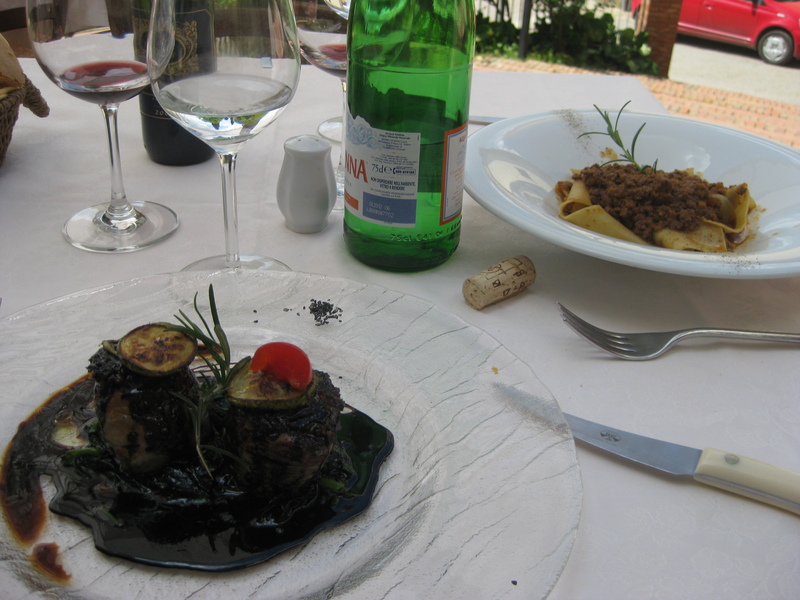 Then back to Siena and for the meal I had been waiting for. On this trip there were only two dinner reservations I made. La Vista in Varenna, Lake Como and Antica Osteria da Divo in Siena. I found this restaurant on TripAdvisor as a “must visit” and then did some more digging to find out it truly is a gem in the city. Although the food is to die for, you go for the atmosphere. 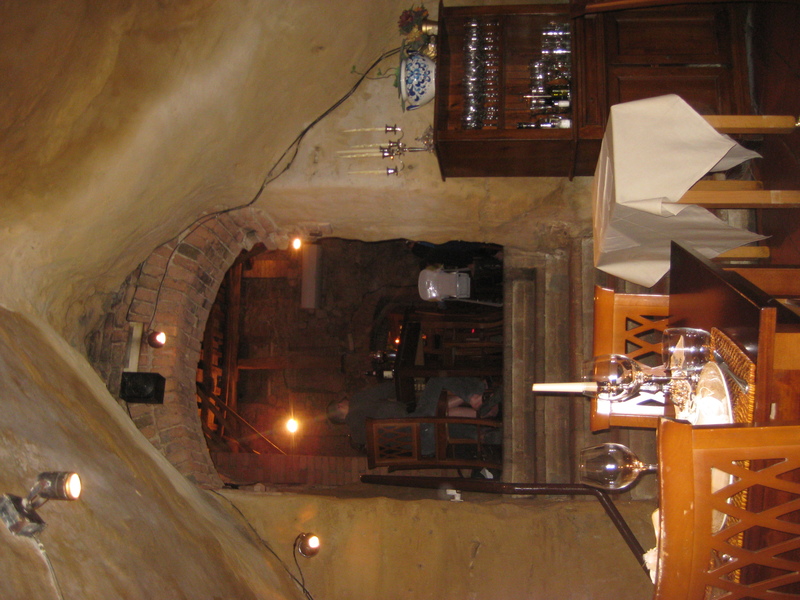 The restaurant is actually in ancient Estruscan tombs – so you feel as if you are eating in a cave. Surrounded by history, stone and candlelight, the experience is once in a lifetime. Because it was a “special meal “(which seems silly to say on this trip since every meal was memorable), we went all out. Bottle of nice wine, primi, segundi and dessert. 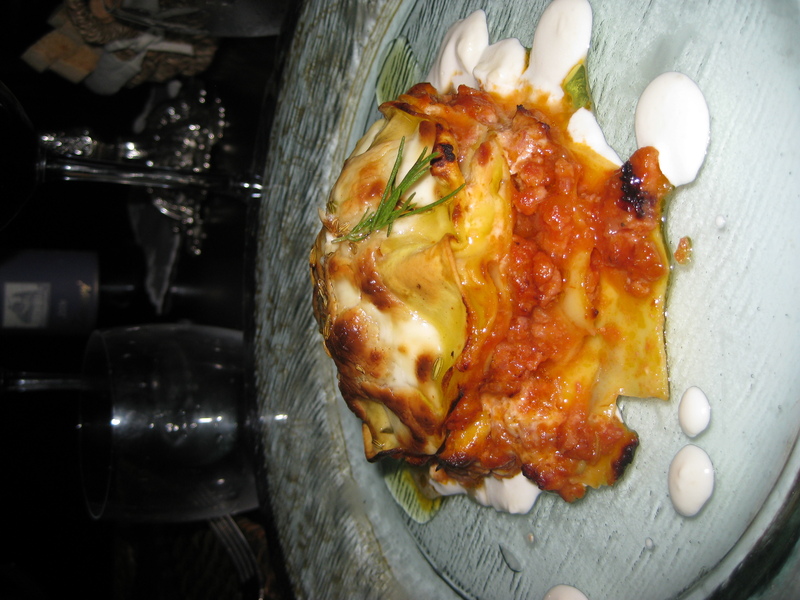 For our primi, I got a lasagna and Rob a cannelloni. Amazing. We both got the stuffed pork as our segundi. 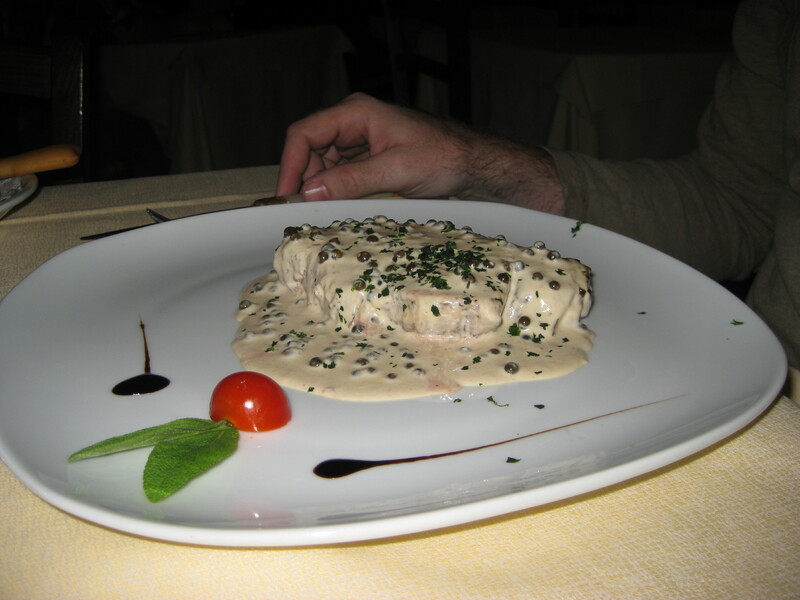 As you may know, Tuscany is known for its pork, so again, we had to try the regional favorite. We were not disappointed. For dessert we got biscotti and vin santo. 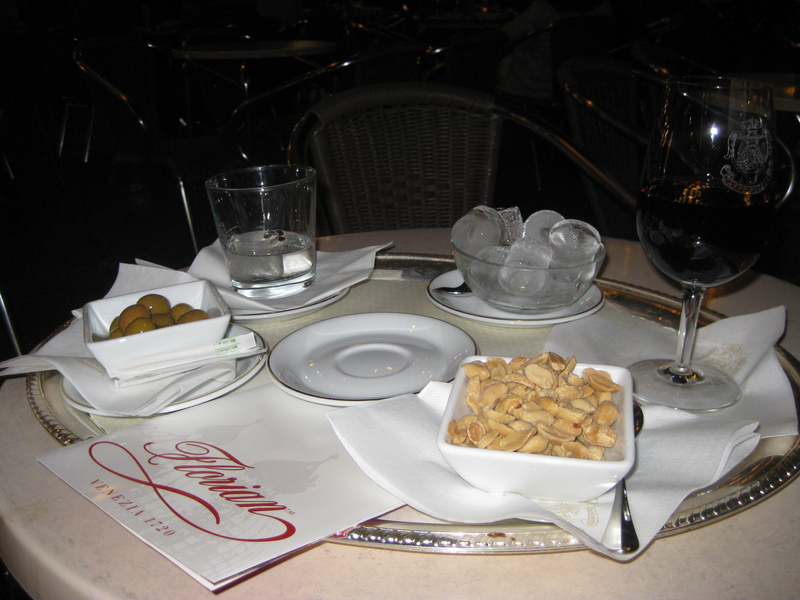 We left satisfied and full, then walked around the duomo at night, and experienced the beautiful main square in Siena. What a gorgeous city. Did I mention we ate a lot of gelato? Our time in Tuscany was something I will never forget – we were able to experience the foods and wines that have made it so famous. We experienced the “must dos” like Pisa and Siena, but also went off the beaten path to places like Pietrasanta and Lamole to experience the Italian culture at its purest. Although Lake Como and Cinque Terre leave you awestruck with their beauty, Tuscany has a different kind of beauty – one that is more real, and in a strange way feels like home. So yes, it has been a month since my last blog post. No, I didn’t stop cooking and I certainly didn’t stop eating. I spent 2 weeks in Italy, vacationing with my husband, and 2 more debating how on earth I would going to write a blog post (or multiple blog posts) about it. The reality is, we will be doing this in phases. 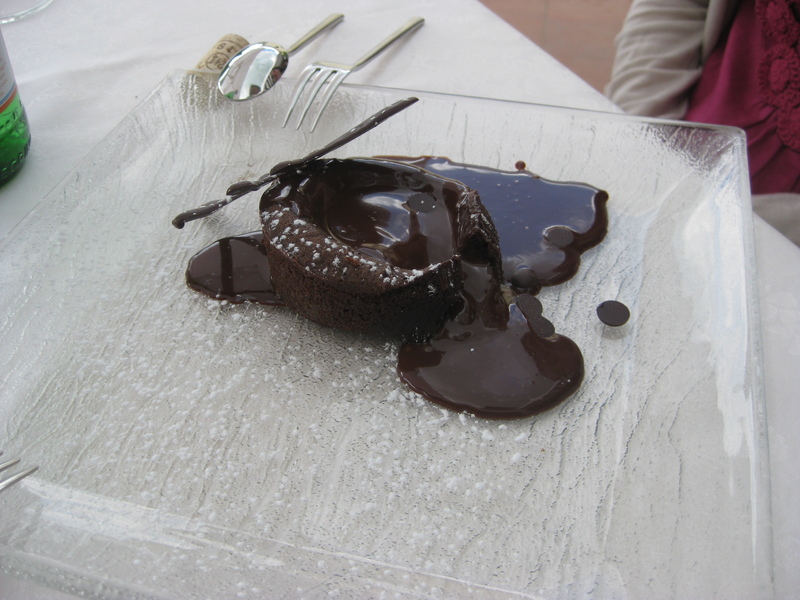 We took a cooking class in Lake Como that warrants its own blog post. 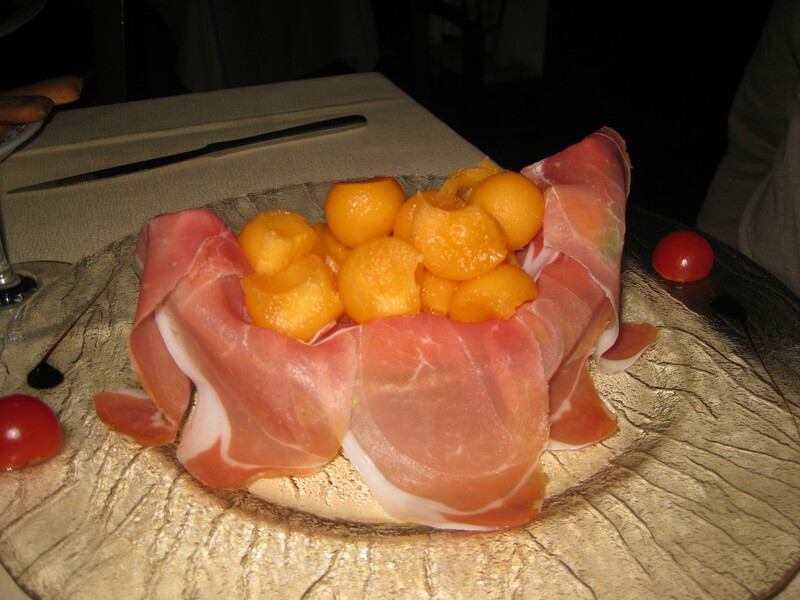 Also, each region had such different, unique food – I will be breaking this out into Northern Italy (Venice, Lake Como), Cinque Terre/Italian Riviera, Tuscany, Umbria and Rome. I was lucky enough to have been to Italy once with my parents, but I barely dipped my toe into the culture, the food and the wine. I knew I needed to go back. On the flip side, my Italian husband (whose grandfather came from a small town in Tuscany called Pietrasanta) had never been. We love food. We love wine. It seemed so obvious. So, on our 3 year anniversary, I surprised my husband with plane tickets for the next spring, and 8 months later we were on a very long Delta flight to Venice for two weeks of relaxation, romance, scenery, food and wine. And more wine. I did my culinary homework before the trip – reading about the foods in each region and studying up on my issues of La Cucina Italiana (I highly recommend it). I started to learn what areas were known for, what you “have to have” in each city, and the importance of all of the Italian basics. 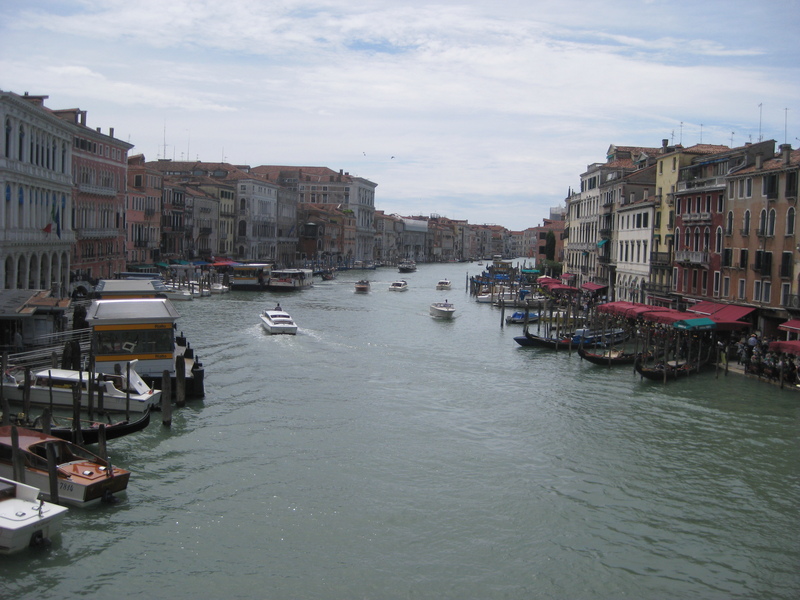 Our trip began in Venice, and I will admit I was so enamored by the romance and a bit blurred by jetlag, that I didn’t take photos of much food in this city. But, it was obvious the abundance of seafood. Our first night when my husband got Carbonara (my personal favorite) I went with a seafood pasta. 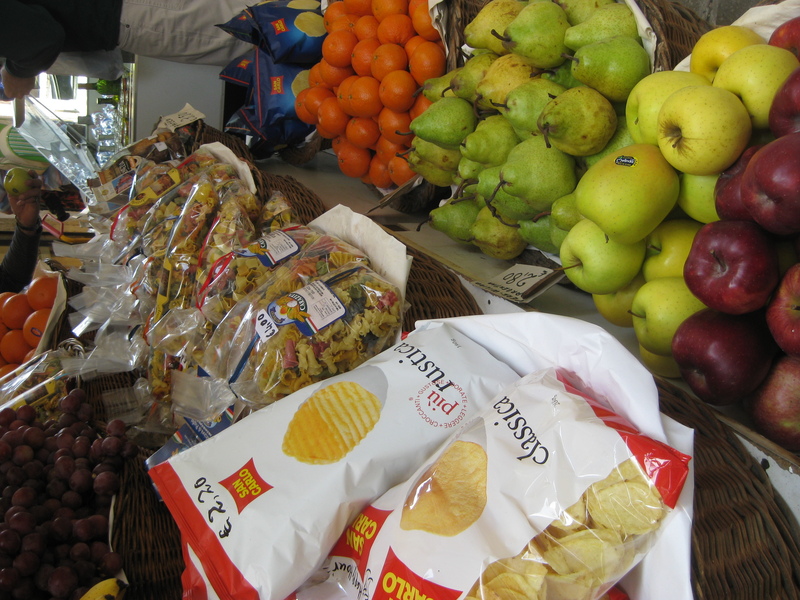 Of course, it was a small taste of what 2 weeks in Italy would be like – food heaven. 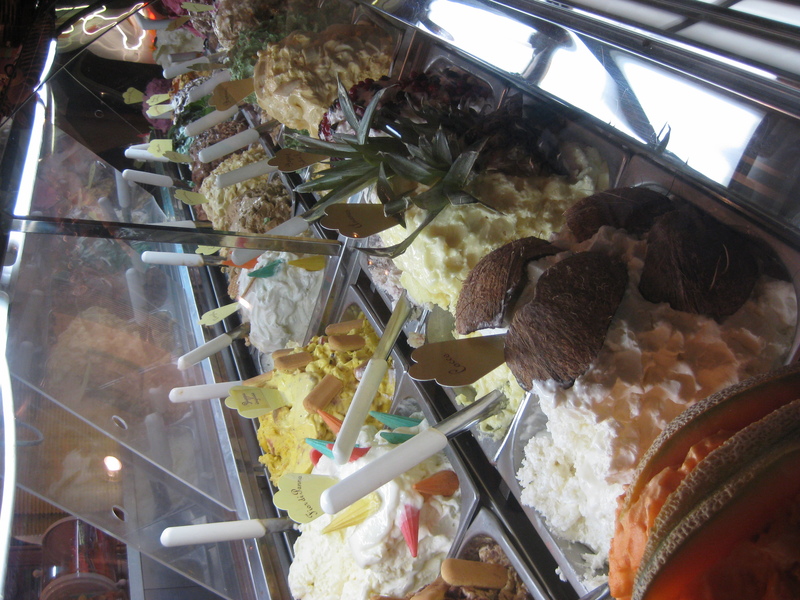 Also, in Venice we had our first gelato (which was followed by MANY more) – there is nothing else like it! 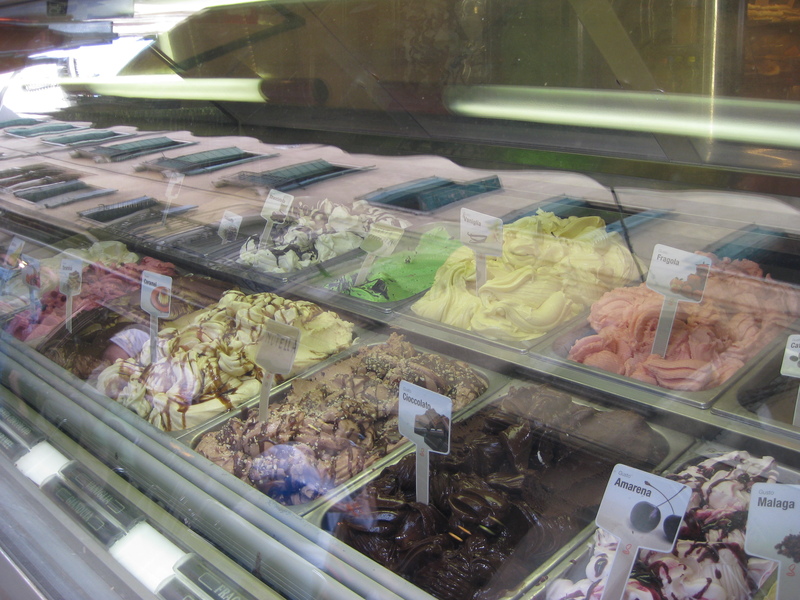 Gelato is make with milk instead of cream (which is how ice cream is made) so gelato is lighter and smoother. After a mere one night in Venice, we took the train to Varenna on Lake Como. I was particularly excited about this city, and not for the chance of running into George Clooney (although it would have been nice.). 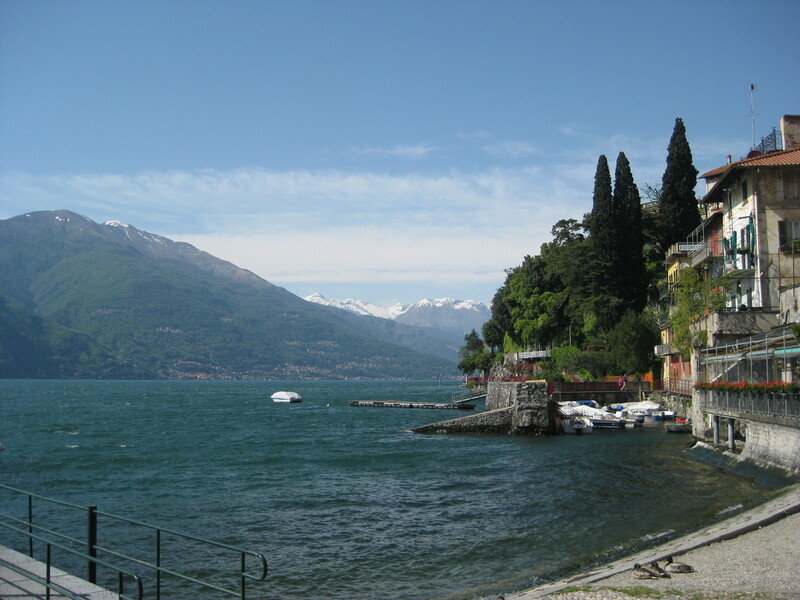 I have heard that Lake Como is a gem – a still somewhat off the beaten path vacation area for wealthy Milanese. The alpine lake is a crystal blue, the alps show their snow caps in the distance and the little villages are quaint and surreal. Every view was a postcard. 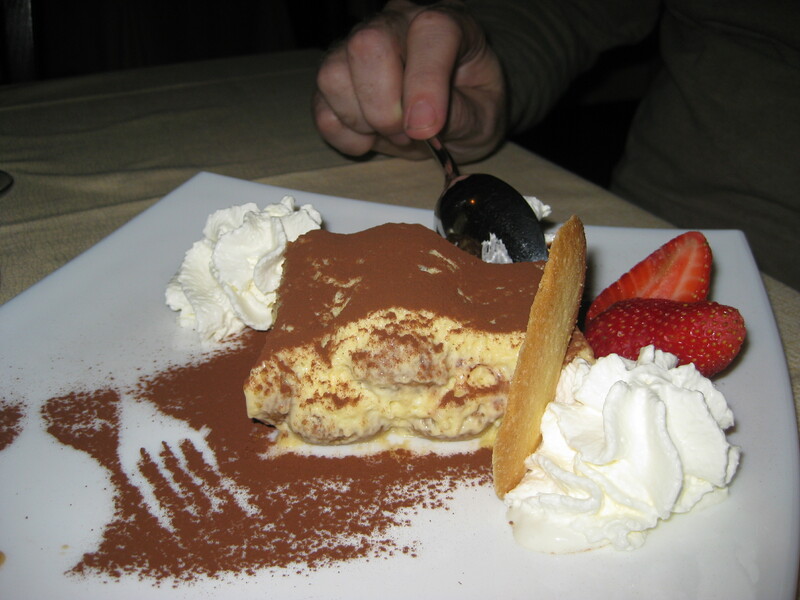 Our first night in Varenna we had reservations at Ristorante La Vista – very well known for amazing cuisine. We each started with a shrimp bruschetta that was amazing, the freshness and slight citrus of the dish woke up your palate. 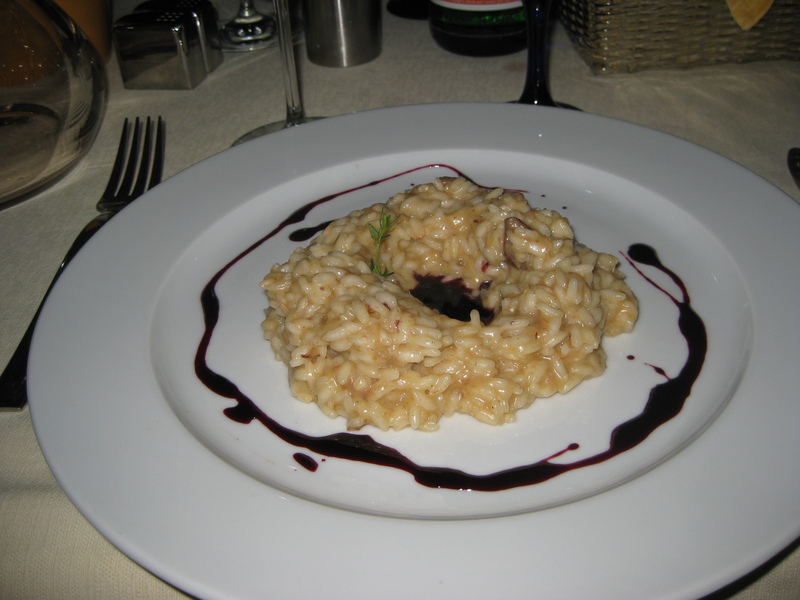 My entree was a risotto with beef, yet instead of the traditional broth sauce, it was a heavy wine sauce, drizzled with a red wine syrup. It seemed so intriguing on the menu, I knew I had to try it and it was so rich and deep with flavor. I could never recreate it. My husband had a filet mignon with a balsamic glaze. 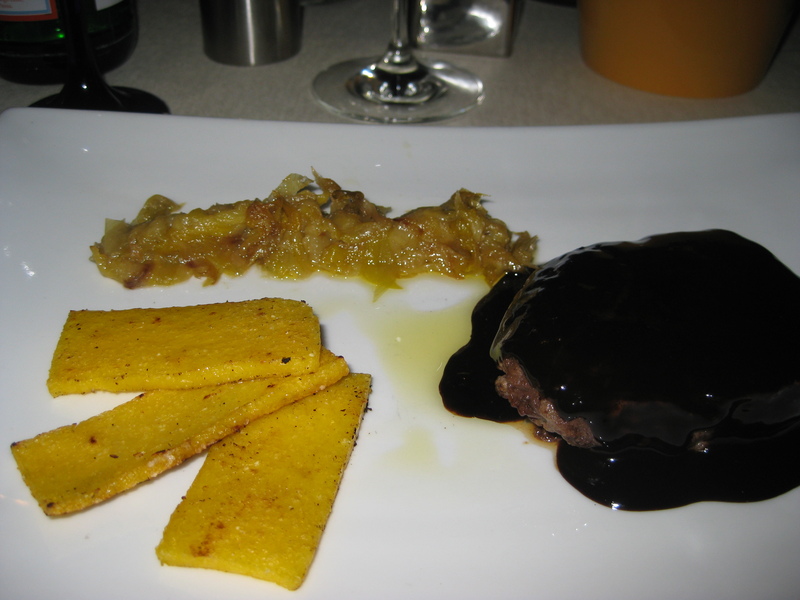 I beamed with pride when he told me it tasted like my filet mignon I make for him with balsamic (on this blog) but of course the quality of the balsamic in Italy surpasses anything we have in the US, so it certainly was a notch above. 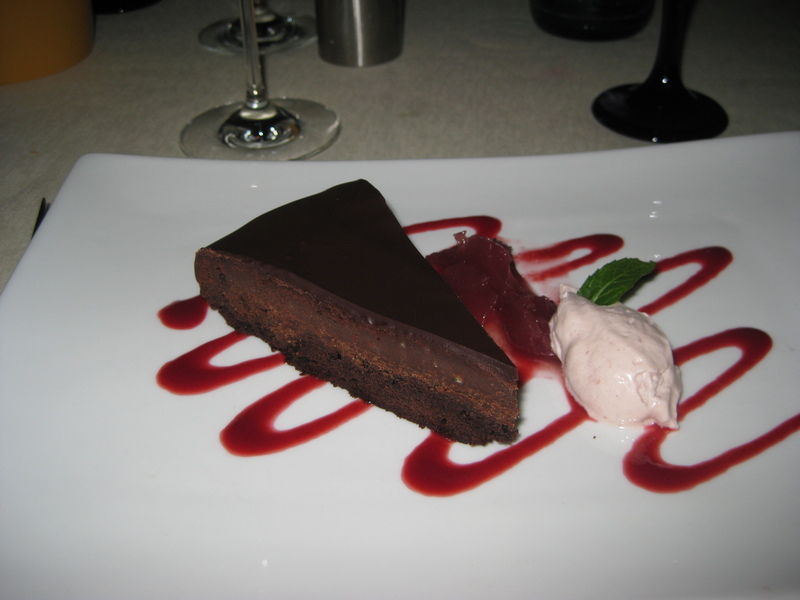 Dessert was a chocolate dream on a plate. 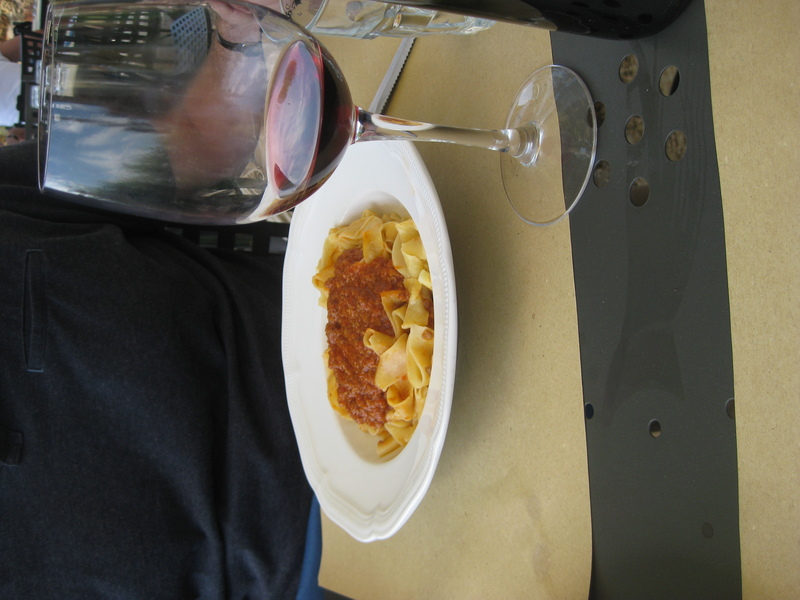 And complementing our meal along the way was a splurge wine – a Barolo. Lake Como is close to the Barolo region and as we attempted to eat regional cuisine and drink regional wine on the trip, we knew it was the right wine for the night. 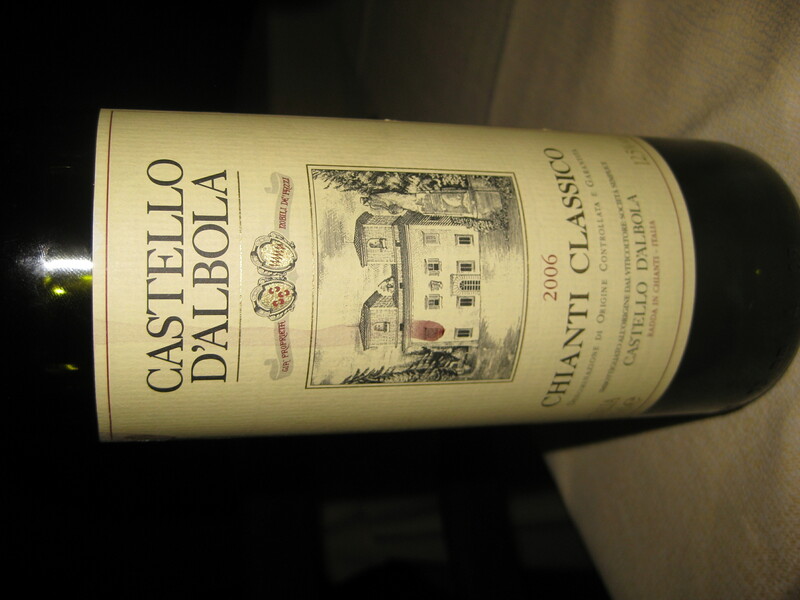 It was one of the best bottles of wine I have ever had. As if we hadn’t had our culinary overload on our first night, on day two we were picked up in the Varenna square by Francesca who wove us up some hills for 10 minutes (Italian driving at its best) to her father Moreno’s restaurant in Perledo. We partook in a cooking class at his restaurant – 5 hours of cooking, drinking, eating and hearing Moreno’s stories. As I mentioned, this experience deserves its own entry, so I will do one at a later date. So far to date, I have only made one recipe with lamb. I know, it is obvious that it scares me a bit – especially since the only recipe I have used lamb in is pastitio (using only ground lamb). But, I thought I would continue to ease into the meat, and try a lamb stew. 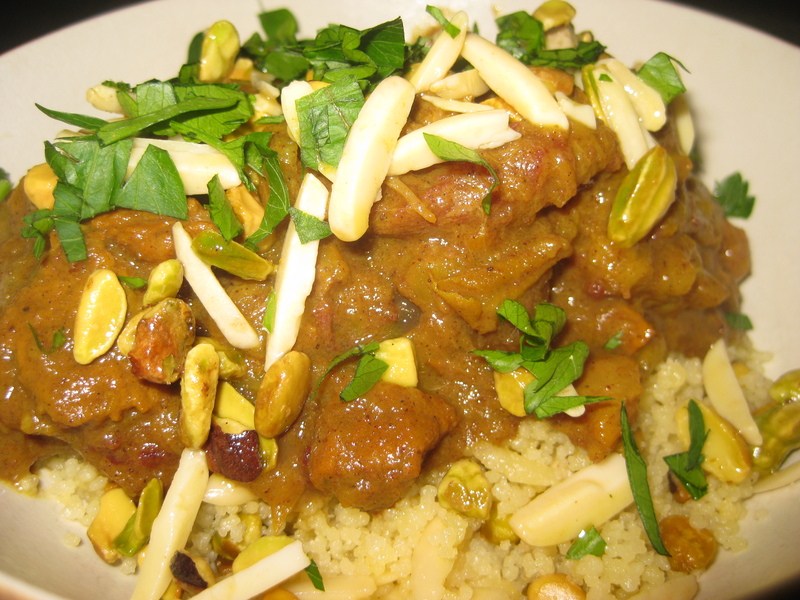 Previously I blogged about a Moroccan stew that is one of our winter favorites. This one looked a bit similar, but had lamb, a few different spices and the addition of honey. It was a cold winter night (hopefully one of our last) so I gave it a try. The stew is so hearty and warming, it makes you feel cozy inside – the cilantro is a bright addition to the heavy dish and the pistachios (although I originally I thought were odd) gave a great flavor and crunch. I served it over couscous in true African tradition, but you could certainly serve without. I got this recipe from Cooking Light and it came with a wine pairing so I thought I would try the two together. I was happy when I found the wine at my local Biggs and on sale for $20. 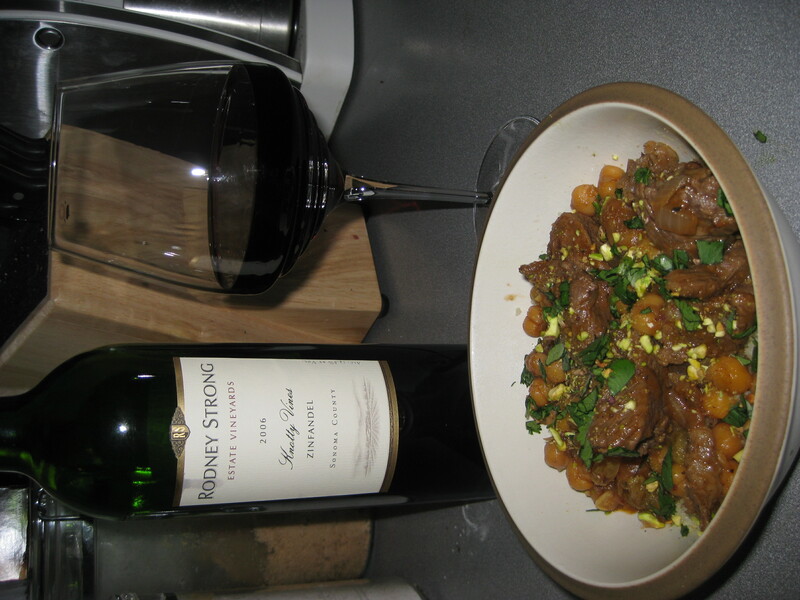 It is a Rodney Strong 2007 “Knotty Vines” Zin from Sonoma County. If you can find it, I would recommend it with the tagine – it has a deep fruit flavor that complements the sweet and spicy nature of the dish. SPECIAL NOTE: “Tagine” is named after the pot in which the stews are cooked in Northern Africa. It is truly unique – like a Dutch oven but with a cone-shaped lid. Most of us don’t have one, so a Dutch oven works perfectly! Heat a large saucepan over medium-high heat. Add oil to pan; swirl to coat. Add lamb; sauté 4 minutes, turning to brown on all sides. Remove lamb with a slotted spoon. Add onion, salt, pepper, and cumin to pan; sauté 4 minutes, stirring occasionally. Add garlic; sauté 1 minute, stirring constantly. Return lamb to pan; stir in tomato paste and honey. Cook 30 seconds, stirring constantly. Add broth, raisins, and chickpeas; bring to a boil. Reduce heat to medium, and cook 50 minutes or until lamb is tender, stirring occasionally. Sprinkle with pistachios and cilantro. When I told my friends the other day I made Kibbeh for dinner, they looked at me like I had 3 heads. 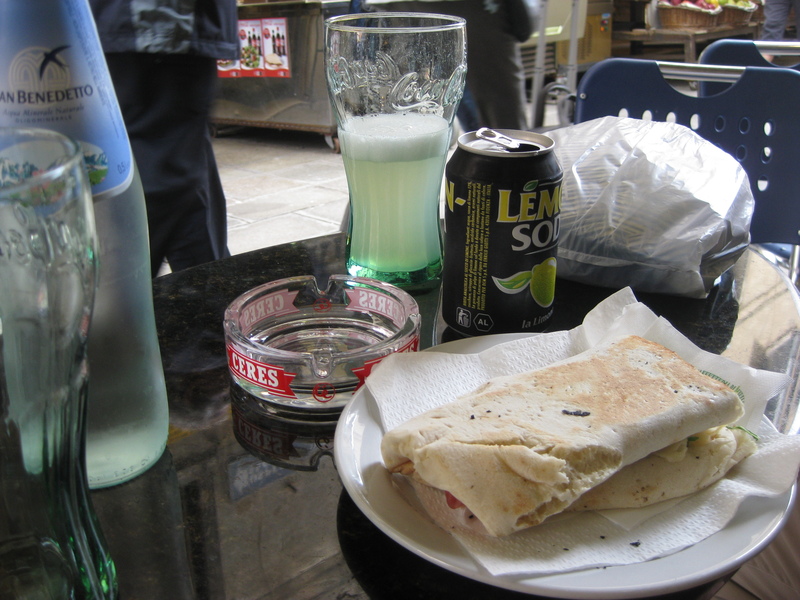 “It is the national dish of Lebanon,” I declared proudly. “Um, do you have Lebanese heritage?” They asked. Well, I am afraid the answer was no – I am a little Irish, a little German and very Italian by marriage. But, I read the recipe in my Gourmet cookbook and it sounded like a unique dish – why not? I will admit to all of you that making this took a bit of courage and a VERY high probability we would be ordering take out. Apparently, Kibbeh (sometimes called Kibbe) was the dish by which a woman’s skill in the kitchen was measured in ancient Lebanon and Syria. Talk about pressure! You can make it in a pie plate or cast iron skillet – not surprisingly I recommend using a cast iron skillet if you have one (and if you don’t you really should invest in one!). My skillet has yet to let me down, and it helps form the “pie” with its higher sides. Cook onion in oil in a 12-inch heavy skillet over moderate heat, stirring occasionally, until golden, 8 to 10 minutes. Add lamb, allspice, salt, cinnamon, and pepper and cook, stirring and breaking up lumps, until lamb is no longer pink, about 5 minutes. Remove from heat and stir in 1/3 cup pine nuts. Cover bulgur by 1 inch with cold water in a bowl. When dust and chaff rise to surface, pour off water, then repeat rinsing 2 more times. Cover rinsed bulgur with cold water by 1 inch and let stand 10 minutes. Drain in a fine-mesh sieve, pressing hard on bulgur to remove excess liquid, and transfer to a large bowl. Pulse onion in a food processor until finely chopped. Add lamb, allspice, salt, cinnamon, and pepper and pulse until onion is finely minced (meat will look smooth). Add to bulgur and mix with your hands to combine well. Lightly grease pie plate with 1/2 tablespoon olive oil. 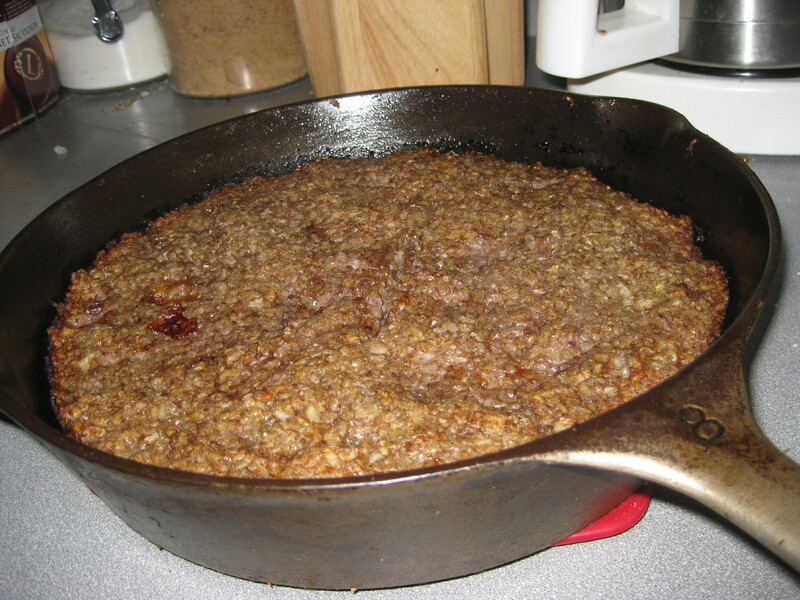 Press half of bulgur mixture evenly onto bottom and up side of plate (up 1 inch if using skillet). Spoon filling evenly over bulgur mixture. Spoon remaining bulgur mixture over filling and spread to cover, smoothing top. Brush top with remaining olive oil and score in a crosshatch pattern with a paring knife. Bake kibbeh in middle of oven until cooked through, 35 to 40 minutes. Preheat broiler. 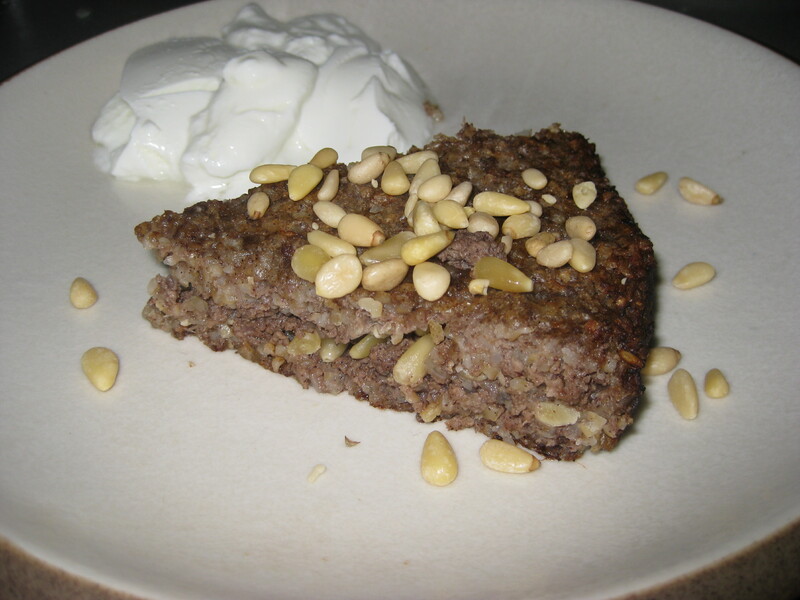 Broil kibbeh 5 to 7 inches from heat until top is golden brown and crusty, 3 to 5 minutes. Let stand 5 minutes before serving. Now I will admit, when I made pastitsio the other night, it was the first time I had even attempted it. 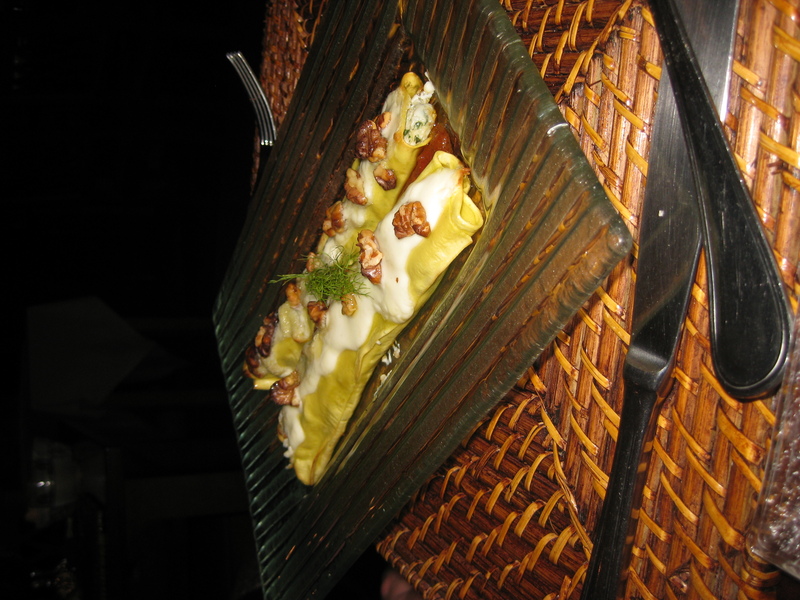 It is a Greek dish – almost the Greek’s version of Italian lasagna. The bottom is a traditional pasta with tomato sauce (with some comfort spices like cinnamon) topped with a cream topping – either a custard or a cream sauce. When I made it, one thought came to mind – why on earth hadn’t I made this before?! It is an amazing comfort dish that makes you feel all warm inside. To give you an indication as to how filling it is, the Greeks would traditionally eat pastitsio on Easter after a long period of fasting. This version has lamb, but I have seen others with any type of meat. If you aren’t sure if you like lamb, this would be a great dish to test it out – it gives an earthy flavor that compliments the sauces perfectly! This particular recipe is from my PBS station, The Everyday Food television series. Preheat oven to 375 degrees. Cook pasta and drain. Meanwhile, in a large saucepan over medium heat, cook lamb, breaking apart pieces with a wooden spoon, until no longer pink, 6 to 8 minutes. Add onions; cook, stirring occasionally, until translucent, about 5 minutes. Transfer to a colander, drain fat, and discard. Return lamb to pan; add wine. Cook over medium heat until almost all liquid has evaporated, about 5 minutes. Stir in tomato paste, cinnamon and 2 cups water; simmer, stirring occasionally, until thickened, 15 to 20 minutes. Season with salt and pepper. Make Parmesan cheese sauce while mixture is simmering. In a medium saucepan, melt butter over medium heat; whisk in flour until incorporated, about 30 seconds. In a slow steady stream, whisk in milk until there are no lumps. Cook, whisking often, until mixture is thick and bubbly and coats the back of a wooden spoon, 6 to 8 minutes. Stir in cayenne, if desired, and Parmesan. Add pasta to lamb mixture, transfer to a 9- by 13-inch baking dish. Pour sauce over the top, smoothing with the back of a spoon until level. Bake until browned in spots, 35 to 40 minutes. Remove from oven, let cool 15 minutes before serving.